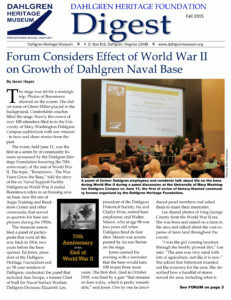 DAHLGREN, Va. – A community forum hosted at the University of Mary Washington’s Dahlgren Campus on June 11 will feature a panel discussion focused on the impact of World War II on Dahlgren and the surrounding community. Held in the UMW Dahlgren Campus’ University Hall, the community forum will be open to the public and offered at no charge. The event will begin at 4:30 p.m. with an informal reception and the program will begin at 5 p.m. Guests are asked to register to attend the forum. Registration can be made on line at https://www.eventbrite.com/e/wwii-community-forum-boomtown-the-war-years-meld-dahlgren-community-tickets-17023682292. The Dahlgren Heritage Foundation is targeting 2015 as a year-long opportunity to observe the 70th anniversary of the end of World War II through the lens of the innovations and technology developed and tested by the U.S. Navy at Dahlgren, Va. that helped determine the outcome of that war and continue to be critical to the tactical and strategic capabilities to U.S. armed services today and into the future. The centerpiece of this year-long commemoration will be a series of quarterly community forums hosted at the UMW Dahlgren Campus. The June 11 forum opens the series with a guest panel that includes Elizabeth Lee, president of the King George Historical Society; Ann Swope, former environmental scientist, safety and environmental director and chief of staff for Naval Surface Warfare Center Dahlgren Division; Ira West, a mathematician who worked in exterior ballistics, geoballistics and anti-submarine warfare and headed both the Systems Simulation and Operational Support Branches of Dahlgren Division’s Strategic Systems Department prior to his retirement in 1990; and Gladys West, a programmer with Dahlgren Division for large-scale computers and project manager for data processing systems used in the analysis of satellite data. Prior to her retirement in 1998, her work contributed to the development of the modern Global Positioning System. The panel will be moderated by Ed Jones, president of the Dahlgren Heritage Foundation. And special guest remarks will be provided by Capt. Mary Feinberg, commanding officer for Naval Support Activity South Potomac. The World War II commemorative programming of 2015 will also provide a platform for the Foundation to prepare for the centennial of the Navy base at Dahlgren in 2018. The Foundation anticipates that the Dahlgren Heritage Museum will factor into the base’s centennial observance and will serve as helpful catalyst not only to tell the history of Dahlgren, but also to promote its future. The Dahlgren Heritage Museum will host special openings and programs to coincide with the quarterly community forums. Plans are underway to showcase special exhibits at the museum and coordinate with military commands on Naval Support Facility (NSF) Dahlgren for public tours of the base. Additionally, the museum plans to host a student STEM (science, technology, engineering and math) activity and student tour of the base. The goal of the Foundation is to generate a public understanding of the impact the U.S. Navy base at Dahlgren and the surrounding community has had in using science and technology to strengthen national defense, particularly through support for warfighters. Dahlgren’s function as the Navy’s principal proving ground at the outset of World War II provided a critical capability for proofing and testing every major naval gun and all ammunition supplied to the Fleet to directly influence and support force readiness throughout the global conflict. Dahlgren’s ballistic ranges, coupled with the scientific and technical expertise resident at the base at the outset of World War II, played an important role in the nation’s development of its first atomic weapon delivery system. Dahlgren’s ballistic ranges continue to provide a unique capability for proofing and testing every major naval gun and Fleet ammunition, as well as supporting RDT&E and proof testing for leading-edge weapons systems for Navy and other U.S. armed services. The siting of the Naval Ordnance Relay Calculator (NORC) computer and further evolutions of computer systems employed at Dahlgren have been key to development of leading-edge ballistics research, space geodesy and space surveillance, and computer/ weapon systems integration, and have provided essential operational support to Navy and other U.S. armed forces on both strategic and tactical levels. Today, Dahlgren has grown to serve as home to multiple DoD commands that execute a broad spectrum of scientific and response-force missions serving all branches of the U.S. armed services. NSF Dahlgren makes a significant economic contribution to the local community and the installation’s military commands, as a whole, serve as the largest employer in King George County, and one of the largest employers in the greater Fredericksburg area.